The Chao Phraya river is what gives Bangkok life; It cuts through the heart of the city. This essential waterway begins in Nakhon Sawan in central Thailand, and then continues to flow through Bangkok and on to the Gulf of Thailand. Just north of Bangkok, in a city area known as Nonthaburi, the Chao Phraya river begins to widen and spread, making way for a man-made island known as Ko Kred. It's just an hour away from central Bangkok and still part of the metro urban area, but Ko Kred feels like you're in a country village, far removed from the city. 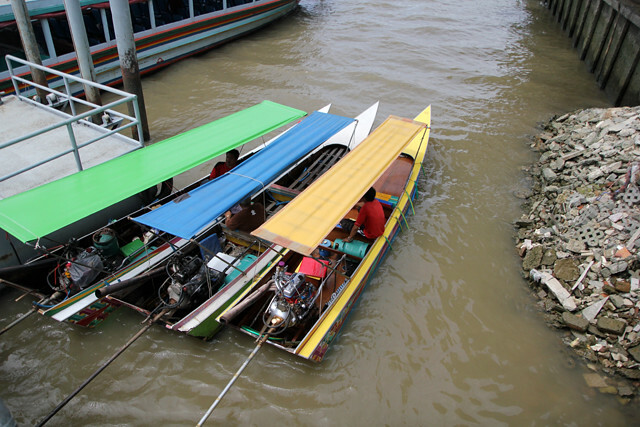 The easiest way to get to Ko Kred is by taking Bangkok's public river boat service to the final Nonthaburi pier. 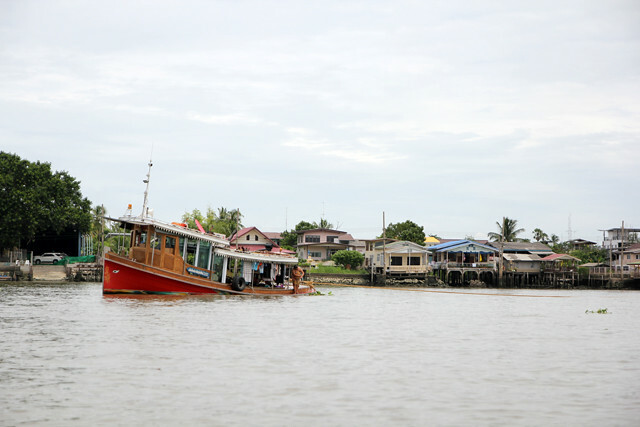 From the public pier, you can then purchase a ticket on board a small longtail boat to take you the remaining distance. The longtail boats slice through the water and normally dock at one of the temples on the island. At this point you are free to disembark and continue your exploration of this relaxing island in the Chao Phraya. 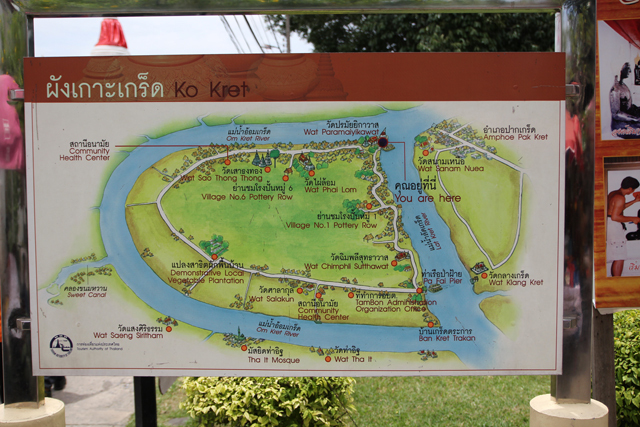 Ko Kred is not a natural island, it was created back in 1722 as a result of digging the extensive canal system. During Thailand's history, the area and also the island was mostly inhabited by ethnic Mon, originally from Burma. Now there are seven main small villages on the island, each very sleepy and peaceful. Ko Kret is most busy and visited during the weekends when local Bangkok residents come to the island for a day out on the town. Though you can visit any day of the week to see local life and explore on your own, many more shops and restaurants are open on Saturday and Sunday. 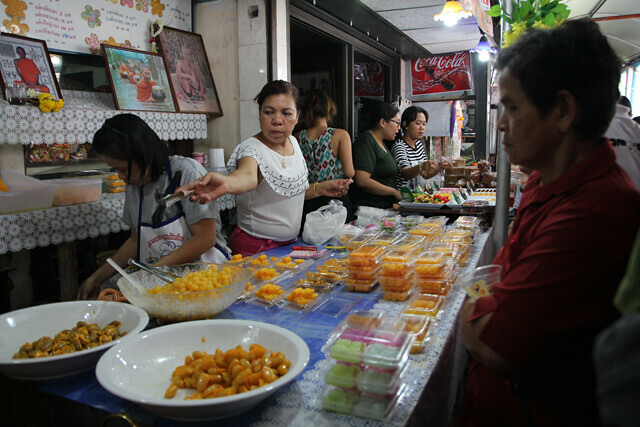 Along with passing through a handful of Buddhist temples, the east side of the island is filled with vendors that serve all sorts of trinkets and snacks. Deep friend flowers and fritters are a famous and widely available snack on the island. You'll also find plenty of small coffee shops and a selection of restaurants serving mostly soup noodles, like tom yum noodles or boat noodles. Ko Kred is especially famous for its pottery, a tradition that came with the ethnic Mon population. Many of the stores sell all sorts of different clay pots, some of which are plain and others that are neatly detailed and decorated. If you're looking to purchase a souvenir from the island, pottery is the best option. 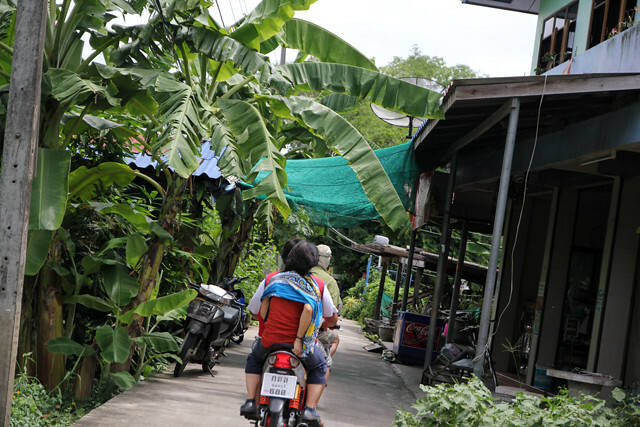 Along with shopping for pottery and eating, one of the most popular things to do at Ko Kret is to rent a bicycle and circumference the island. For 50 THB for the day, you'll be able to peacefully cycle along the elevated concrete walkways, passing small villages on the way. The entire route is about 5 – 6 kilometers. For a quicker trip around the island, you can jump on the back of a motorbike and they'll deliver you from one side to the other in just a few minutes. Last time I visited Ko Kred, I was in a little bit of a time constraint, so I hopped on a motorbike and had a fun speedy trip through the island. Visiting Ko Kret makes a great weekend day trip from Bangkok! Hey mark your lovely pics make me very curious specially those snacks i wonder to see pinky snacks are they really made by flowers and how was their taste. i am a chef and now this thai stuff i gonna explore very soon.Thanks for so lovely post mark.